According to the calendar, it is now officially spring — despite the fact the temperatures in the Midwest are stuck in winter mode and snow is forecast for this weekend. 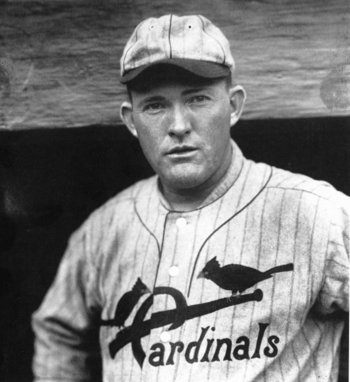 So as time continues to crawl toward Opening Day at a frustratingly slow pace (especially with the Cardinals having another day off yesterday), that famous Rogers Hornsby quote comes to mind. Plenty of staring still to do as we wait for real spring, right? You can pass the time looking at other quotes from Rajah — there’s an entire YouTube video of them, complete with music by Al Jolson — or you can see him and his Cardinals teammates take on Babe Ruth, Lou Gehrig and the Yankees in this tremendous video about the 1926 World Series. The music, the announcer, the footage — all just terrific. My favorite line: “This is the game in which Ruth got three homers and the Cards got a headache.” Those Cards got the last laugh in the end. A little more on the 1926 team, which won World Championship No. 1 for the Cardinals: Hornsby was player/manager, and a big reason why they won, despite his “down” year batting just .317 — down since the two previous seasons he’d hit .424 and .403. Other key contributors included National League MVP Bob O’Farrell, Jim Bottomley and mid-season acquisitions Billy Southworth and Grover Cleveland Alexander. There’s one important part missing from that description in the video of Game Seven of the Series, however. Babe Ruth ended the game and the Series — by being thrown out while trying to steal second base. This entry was posted in General Cardinals and tagged 1926, Babe Ruth, Rogers Hornsby, Throwback Thursday, World Series by Christine Coleman. Bookmark the permalink. Grover Cleveland Alexander was 39 in that World Series. He looks like he’s in his late 50s in this clip — man, people got old quickly back then. Of course, maybe he looks old because of the black and white film, or maybe it’s because he suffered through a tour as an infantryman in World War I.